Dental veneers are a popular option for people living in the Gilroy, California area who want to correct the appearance of cosmetic issues like “gapped” or crooked teeth or worn, misshapen teeth. 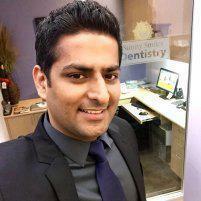 At Sunny Smiles Dentistry, Dr. Sandaldeep Singh can help you enjoy a more beautiful smile with top-quality veneers made of durable, tooth-colored porcelain. Your custom-fit veneer will improve your smile and help you look and feel your best. Call Sunny Smiles Dentistry today or use their online scheduling system and make an appointment to learn how veneers can put a new smile on your face. Veneers are thin “covers” of porcelain that are applied to the front surface of a tooth to correct cosmetic issues so your smile looks beautiful, natural, and healthy. Porcelain veneers are durable, and they’re designed to perfectly blend in with your natural teeth. Veneers are one of the most popular cosmetic dentistry treatments, helping people enjoy beautiful, natural-looking, picture-perfect smiles. Veneer procedures usually take two office appointments. During your first appointment, Dr. Singh prepares your tooth for the veneer by removing a small amount of the tooth surface material. This step ensures your veneer is level with the surfaces of the neighboring teeth so the veneer blends in. Once the tooth is prepared, Dr. Singh takes an impression of the tooth, sending it to a dental lab that specializes in high-quality dental restorations. He’ll also select the right shade for your veneer. Before you leave, Dr. Singh places a temporary veneer on your tooth to protect it. At your second appointment, Dr. Singh removes the temporary veneer and places the permanent veneer on your tooth, attaching it with a strong bonding agent, then buffing it for a natural look. No. Porcelain veneers are very durable and you can care for your veneer with regular brushing and flossing, combined with routine dental visits and cleanings. Although veneers are very strong, they can be damaged, just like a natural tooth. To prevent chips and cracks, avoid biting or chewing on hard foods like ice or hard candy, and never use your teeth as prying tools.